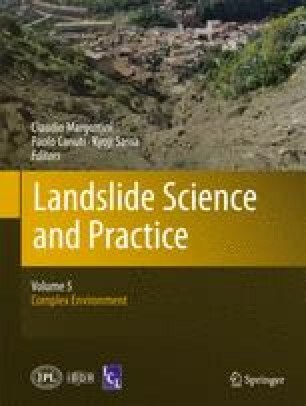 The present work deals on an example of large landslide at Marina di Altidona, along the central Italy Adriatic coast, representative of many situations observed along the sea-cliff areas of the Marche and the Abruzzo regions; all these phenomena are located in areas which correspond to the most uplifted sectors during the Quaternary. The data collected, allow to hypothesize a past activation of a huge mass movement along a deep sliding surface, presently submarine. It was related to the high relief connected to the strong tectonic uplift of the middle-upper Pleistocene, to which a probable high seismicity was also associated. The validation of the geomorphological model has been carried out by applying a Finite Difference Numerical Code (FLAC_2D) to a huge gravitational movement and, in particular, by characterizing the dynamic evolution along significant transects. The authors wish to thank the anonymous reviewers for their critical review.